Financial year closing is most important work for every businessman , tax professional as well as for taxpayers.Today is last day of Financial year 2018-19 i.e 31st March 2019.We have summarized few actions that are associated with the financial year closing and which may be helpful for you. Income tax,Service tax ,Vat , Excise and many other taxes are assessed on the Financial year basis,in fact all the taxes in India (which we know ) are assessed on the Financial year basis only . So in Taxation system 31st March has a Major landmark date not only due to closing of the Financial year but also due to various due date correlated with the end of financial year i.e 31st March. We have given few major issue related to 31st March.The list provided hereunder is not exhaustive and all viewers are requested contribute to list. Generally taxpayers thinks that [Advance tax] due dates are 15 June, 15 Sep, 15 Dec and 15 March ,but forget about 31st March. 31st March is last day for depositing your advance tax under Income tax .If you have balance advance tax then pay it by 31st March , otherwise you have to bear another 1 % interest u/s 234B at least for one month.So even if you pay balance tax on First April,2019 ,you have to pay interest on balance advance tax u/s 234B for one month. Second point under advance tax is, if you have Income from Capital Gain then Income tax rules/act provide you exemption from depositing installment of advance due on capital gain amount before the accrual of such capital gain Income. but this is subject to condition that you pay balance tax with in Financial year.If you are unable to deposit the advance tax due on capital gain with in financial year then above exemption will not be available to you. Example: Suppose a person earned income from capital gain Rs 12,00,000/- on March,18 and advance tax due is Rs 1,33,900/- .In this case, if person pay his advance tax by 31st March then no interest is to be charged u/s 234C but if he do not pay advance tax by 31 March , then interest u/s 234C will be payable by him amounting to Rs 4951/- from the first installment due date ?. If the person fails to file the return of income within the time-limit prescribed in this regard, then as per section 139(4) he can file a belated return. For assessment year fy 2018-19 a belated return can be filed within relevant assessment year only or before completion of assessment, whichever is earlier. For financial year 2017-18 (assessment year 2018-19) , belated return can be filed only up to 31.03.2019. Section 139(5) provides that a revised return can be filed by the taxpayer if he discovers any omission or error in the original ITR. March 31, 2019 is the last date to file revised return for the Financial Year 2016-17. The Finance Act, 2017 had restricted the time limit for filing the revised return. Thus, with effect from Assessment Year 2018-19, a taxpayer can file revised return, before the end of relevant assessment year or before the completion of assessment year, whichever is earlier. However, earlier the revised return could be filed, before the end of one year from the end of relevant assessment year or before the completion of assessment year, whichever is earlier. Therefore, for the Financial Year 2016-17 (Assessment Year 2017-18) and Financial Year 2017-18 (Assessment Year 2018-19), the due date for filing of revised return is March 31, 2019. If are planning to save tax u/s 80C or [80D(Medical /health insurance )] or other section then purchase Tax saving instruments like,NSC,PPF ,Life Insurance receipt before 31st March so that you can take maximum benefit provided under these heads. If you have opened your PPF account in 01.04.2002 to 31.03.2003 then 15 years was completed on 31.03.2018 .And if you want to extended your account further for block period of 5 years with contribution each year then you should apply on form H before 31.03.2019(within one year from completion of 15 years). (you can extend your PPF account by any time subject to 5 years each time). If you don't not apply on form H by this date , your account will be extended without subscription and can not be converted back with subscription. The same rule is applicable for extension after first block completion after 15 years. 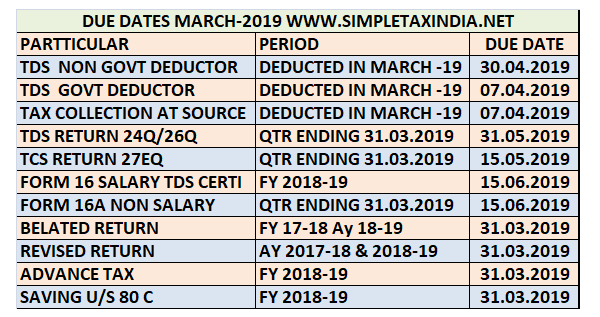 Due date to deposit form 24Q ETDS return (salary TDS) for quarter ending 31.03.2019 is 31.05.2019. Due date to deposit form 26Q Etds return (other than salary TDS) for quarter ending 31.03.2019 is 31.05.2019.